For other uses, see Ramjet (disambiguation). A ramjet, sometimes referred to as a flying stovepipe or an athodyd (aero thermodynamic duct), is a form of airbreathing jet engine that uses the engine's forward motion to compress incoming air without an axial compressor or a centrifugal compressor. Because ramjets cannot produce thrust at zero airspeed, they cannot move an aircraft from a standstill. A ramjet-powered vehicle, therefore, requires an assisted take-off like a rocket assist to accelerate it to a speed where it begins to produce thrust. Ramjets work most efficiently at supersonic speeds around Mach 3 (2,300 mph; 3,700 km/h). This type of engine can operate up to speeds of Mach 6 (4,600 mph; 7,400 km/h). Ramjets can be particularly useful in applications requiring a small and simple mechanism for high-speed use, such as missiles. Weapon designers are looking to use ramjet technology in artillery shells to give added range; a 120 mm mortar shell, if assisted by a ramjet, is thought to be able to attain a range of 35 km (22 mi). They have also been used successfully, though not efficiently, as tip jets on the end of helicopter rotors. Ramjets differ from pulsejets, which use an intermittent combustion; ramjets employ a continuous combustion process. As speed increases, the efficiency of a ramjet starts to drop as the air temperature in the inlet increases due to compression. As the inlet temperature gets closer to the exhaust temperature, less energy can be extracted in the form of thrust. To produce a usable amount of thrust at yet higher speeds, the ramjet must be modified so that the incoming air is not compressed (and therefore heated) nearly as much. This means that the air flowing through the combustion chamber is still moving very fast (relative to the engine), in fact it will be supersonic—hence the name supersonic-combustion ramjet, or scramjet. L'Autre Monde: ou les États et Empires de la Lune (Comical History of the States and Empires of the Moon) (1657) was the first of three satirical novels written by Cyrano de Bergerac, that are considered among the first science fiction stories. Arthur C Clarke credited this book with inventing the ramjet, and being the first example of a rocket-powered space flight. The ramjet was conceived in 1913 by French inventor René Lorin, who was granted a patent for his device. Attempts to build a prototype failed due to inadequate materials. In 1915, Hungarian inventor Albert Fonó devised a solution for increasing the range of artillery, comprising a gun-launched projectile which was to be united with a ramjet propulsion unit, thus giving a long range from relatively low muzzle velocities, allowing heavy shells to be fired from relatively lightweight guns. Fonó submitted his invention to the Austro-Hungarian Army, but the proposal was rejected. After World War I, Fonó returned to the subject of jet propulsion, in May 1928 describing an "air-jet engine" which he described as being suitable for high-altitude supersonic aircraft, in a German patent application. In an additional patent application, he adapted the engine for subsonic speed. The patent was granted in 1932 after four years of examination (German Patent No. 554,906, 1932-11-02). In the Soviet Union, a theory of supersonic ramjet engines was presented in 1928 by Boris Stechkin. Yuri Pobedonostsev, chief of GIRD's 3rd Brigade, carried out a great deal of research into ramjet engines. The first engine, the GIRD-04, was designed by I.A. Merkulov and tested in April 1933. To simulate supersonic flight, it was fed by air compressed to 20,000 kilopascals (200 atm), and was fueled with hydrogen. The GIRD-08 phosphorus-fueled ramjet was tested by firing it from an artillery cannon. These shells may have been the first jet-powered projectiles to break the speed of sound. In 1939, Merkulov did further ramjet tests using a two-stage rocket, the R-3. That August, he developed the first ramjet engine for use as an auxiliary motor of an aircraft, the DM-1. The world's first ramjet-powered airplane flight took place in December 1940, using two DM-2 engines on a modified Polikarpov I-15. Merkulov designed a ramjet fighter "Samolet D" in 1941, which was never completed. Two of his DM-4 engines were installed on the Yak-7 PVRD fighter, during World War II. In 1940, the Kostikov-302 experimental plane was designed, powered by a liquid fuel rocket for take-off and ramjet engines for flight. That project was cancelled in 1944. In 1947, Mstislav Keldysh proposed a long-range antipodal bomber, similar to the Sänger-Bredt bomber, but powered by ramjet instead of rocket. In 1954, NPO Lavochkin and the Keldysh Institute began development of a Mach 3 ramjet-powered cruise missile, Burya. This project competed with the R-7 ICBM being developed by Sergei Korolev, and was cancelled in 1957. On March 1, 2018 President Vladimir Putin announced Russia had developed a (presumed) nuclear powered ramjet cruise missile capable of extended long range flight. In 1936, Hellmuth Walter constructed a test engine powered by natural gas. Theoretical work was carried out at BMW and Junkers, as well as DFL. In 1941, Eugen Sänger of DFL proposed a ramjet engine with a very high combustion chamber temperature. He constructed very large ramjet pipes with 500 millimetres (20 in) and 1,000 millimetres (39 in) diameter and carried out combustion tests on lorries and on a special test rig on a Dornier Do 17Z at flight speeds of up to 200 metres per second (720 km/h). Later, with petrol becoming scarce in Germany due to wartime conditions, tests were carried out with blocks of pressed coal dust as a fuel, which were not successful due to slow combustion. 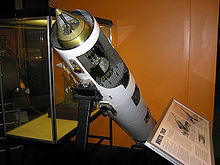 The US Navy developed a series of air-to-air missiles under the name of "Gorgon" using different propulsion mechanisms, including ramjet propulsion. The ramjet Gorgon IVs, made by Glenn Martin, were tested in 1948 and 1949 at Naval Air Station Point Mugu. The ramjet engine itself was designed at the University of Southern California and manufactured by the Marquardt Aircraft Company. The engine was 2.1 metres (7 ft) long and 510 millimetres (20 in) in diameter and was positioned below the missile (see photo). Eminent Swiss astrophysicist Fritz Zwicky was research director at Aerojet and holds many patents in jet propulsion. U.S. patents 5121670 and 4722261 are for ram accelerators. The U.S. Navy would not allow Fritz Zwicky to publicly discuss his own invention, U.S. Patent 2,461,797 for the Underwater Jet, a ram jet that performs in a fluid medium. Time magazine reported Fritz Zwicky's work in the articles "Missed Swiss" on July 11, 1955  and "Underwater Jet" in the March 14, 1949 issue. In France, the works of René Leduc were notable. Leduc's Model, the Leduc 0.10 was one of the first ramjet-powered aircraft to fly, in 1949. The Nord 1500 Griffon reached Mach 2.19 (745.235 m/s; 2,682.85 km/h) in 1958. The Brayton cycle is a thermodynamic cycle that describes the workings of the gas turbine engine, the basis of the airbreathing jet engine and others. It is named after George Brayton, the American engineer who developed it, although it was originally proposed and patented by Englishman John Barber in 1791. It is also sometimes known as the Joule cycle. A ramjet is designed around its inlet. An object moving at high speed through air generates a high pressure region upstream. A ramjet uses this high pressure in front of the engine to force air through the tube, where it is heated by combusting some of it with fuel. It is then passed through a nozzle to accelerate it to supersonic speeds. This acceleration gives the ramjet forward thrust. A ramjet is sometimes referred to as a "flying stovepipe", a very simple device comprising an air intake, a combustor, and a nozzle. Normally, the only moving parts are those within the turbopump, which pumps the fuel to the combustor in a liquid-fuel ramjet. Solid-fuel ramjets are even simpler. By way of comparison, a turbojet uses a gas turbine-driven fan to compress the air further. This gives greater compression and efficiency and far more power at low speeds (where the ram effect is weak), but is more complex, heavier, expensive, and the temperature limits of the turbine section limit the top speed and thrust at high speed. Ramjets try to exploit the very high dynamic pressure within the air approaching the intake lip. An efficient intake will recover much of the freestream stagnation pressure, which is used to support the combustion and expansion process in the nozzle. Most ramjets operate at supersonic flight speeds and use one or more conical (or oblique) shock waves, terminated by a strong normal shock, to slow down the airflow to a subsonic velocity at the exit of the intake. Further diffusion is then required to get the air velocity down to a suitable level for the combustor. Subsonic intakes on ramjets are relatively simple. Subsonic ramjets do not need such a sophisticated inlet, since the airflow is already subsonic, and a simple hole is usually used. This would also work at slightly supersonic speeds, but as the air will choke at the inlet, this is inefficient. The inlet is divergent, to provide a constant inlet speed of Mach 0.5 (170.15 m/s; 612.5 km/h). As with other jet engines, the combustor's job is to create hot air, by burning a fuel with the air at essentially constant pressure. The airflow through the jet engine is usually quite high, so sheltered combustion zones are produced by using "flame holders" to stop the flames from blowing out. Since there is no downstream turbine, a ramjet combustor can safely operate at stoichiometric fuel:air ratios, which implies a combustor exit stagnation temperature of the order of 2,400 K (2,130 °C; 3,860 °F) for kerosene. Normally, the combustor must be capable of operating over a wide range of throttle settings, for a range of flight speeds/altitudes. Usually, a sheltered pilot region enables combustion to continue when the vehicle intake undergoes high yaw/pitch during turns. Other flame stabilization techniques make use of flame holders, which vary in design from combustor cans to simple flat plates, to shelter the flame and improve fuel mixing. Overfuelling the combustor can cause the normal shock within a supersonic intake system to be pushed forward beyond the intake lip, resulting in a substantial drop in engine airflow and net thrust. The propelling nozzle is a critical part of a ramjet design, since it accelerates exhaust flow to produce thrust. For a ramjet operating at a subsonic-flight Mach number, exhaust flow is accelerated through a converging nozzle. 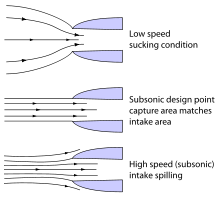 For a supersonic-flight Mach number, acceleration is typically achieved by a convergent–divergent nozzle. Above this speed, given sufficient initial flight velocity, a ramjet will be self-sustaining. Indeed, unless the vehicle drag is extremely high, the engine/airframe combination will tend to accelerate to higher and higher flight speeds, substantially increasing the air intake temperature. As this could have a detrimental effect on the integrity of the engine and/or airframe, the fuel control system must reduce engine fuel flow to stabilize the flight Mach number and, thereby, air intake temperature to reasonable levels. Due to the stoichiometric combustion temperature, efficiency is usually good at high speeds (around Mach 2–Mach 3 [680.6–1,020.9 m/s; 2,450–3,675 km/h]), whereas at low speeds the relatively poor pressure ratio means the ramjets are outperformed by turbojets, or even rockets. Ramjets can be classified according to the type of fuel, liquid or solid; and the booster. In a liquid fuel ramjet (LFRJ), hydrocarbon fuel (typically) is injected into the combustor ahead of a flameholder which stabilises the flame resulting from the combustion of the fuel with the compressed air from the intake(s). A means of pressurizing and supplying the fuel to the ramcombustor is required, which can be complicated and expensive. Aérospatiale-Celerg designed an LFRJ where the fuel is forced into the injectors by an elastomer bladder which inflates progressively along the length of the fuel tank. Initially, the bladder forms a close-fitting sheath around the compressed air bottle from which it is inflated, which is mounted lengthwise in the tank. This offers a lower-cost approach than a regulated LFRJ requiring a turbopump and associated hardware to supply the fuel. A ramjet generates no static thrust and needs a booster to achieve a forward velocity high enough for efficient operation of the intake system. The first ramjet-powered missiles used external boosters, usually solid-propellant rockets, either in tandem, where the booster is mounted immediately aft of the ramjet, e.g. Sea Dart, or wraparound where multiple boosters are attached alongside the outside of the ramjet, e.g. 2K11 Krug. The choice of booster arrangement is usually driven by the size of the launch platform. A tandem booster increases the overall length of the system, whereas wraparound boosters increase the overall diameter. Wraparound boosters will usually generate higher drag than a tandem arrangement. Integrated boosters provide a more efficient packaging option, since the booster propellant is cast inside the otherwise empty combustor. This approach has been used on solid, for example 2K12 Kub, liquid, for example ASMP, and ducted rocket, for example Meteor, designs. Integrated designs are complicated by the different nozzle requirements of the boost and ramjet phases of flight. Due to the higher thrust levels of the booster, a differently shaped nozzle is required for optimum thrust compared to that required for the lower thrust ramjet sustainer. This is usually achieved via a separate nozzle, which is ejected after booster burnout. However, designs such as Meteor feature nozzleless boosters. This offers the advantages of elimination of the hazard to launch aircraft from the ejected boost nozzle debris, simplicity, reliability, and reduced mass and cost, although this must be traded against the reduction in performance compared with that provided by a dedicated booster nozzle. A slight variation on the ramjet uses the supersonic exhaust from a rocket combustion process to compress and react with the incoming air in the main combustion chamber. This has the advantage of giving thrust even at zero speed. In a solid fuel integrated rocket ramjet (SFIRR), the solid fuel is cast along the outer wall of the ramcombustor. In this case, fuel injection is through ablation of the propellant by the hot compressed air from the intake(s). An aft mixer may be used to improve combustion efficiency. SFIRRs are preferred over LFRJs for some applications because of the simplicity of the fuel supply, but only when the throttling requirements are minimal, i.e. when variations in altitude or Mach number are limited. In a ducted rocket, a solid fuel gas generator produces a hot fuel-rich gas which is burnt in the ramcombustor with the compressed air supplied by the intake(s). The flow of gas improves the mixing of the fuel and air and increases total pressure recovery. In a throttleable ducted rocket, also known as a variable flow ducted rocket, a valve allows the gas generator exhaust to be throttled allowing control of the thrust. Unlike an LFRJ, solid propellant ramjets cannot flame out. The ducted rocket sits somewhere between the simplicity of the SFRJ and the unlimited throttleability of the LFRJ. Ramjets generally give little or no thrust below about half the speed of sound, and they are inefficient (less than 600 seconds) until the airspeed exceeds 1,000 kilometres per hour (280 m/s; 620 mph) due to low compression ratios. Even above the minimum speed, a wide flight envelope (range of flight conditions), such as low to high speeds and low to high altitudes, can force significant design compromises, and they tend to work best optimised for one designed speed and altitude (point designs). However, ramjets generally outperform gas turbine-based jet engine designs and work best at supersonic speeds (Mach 2–4). Although inefficient at slower speeds, they are more fuel-efficient than rockets over their entire useful working range up to at least Mach 6 (2,041.7 m/s; 7,350 km/h). The performance of conventional ramjets falls off above Mach 6 due to dissociation and pressure loss caused by shock as the incoming air is slowed to subsonic velocities for combustion. In addition, the combustion chamber's inlet temperature increases to very high values, approaching the dissociation limit at some limiting Mach number. Another example of this is the air turboramjet, which has a compressor powered by a gas heated via a heat exchanger within the combustion chamber. Ramjets always slow the incoming air to a subsonic velocity within the combustor. Scramjets are similar to ramjets, but some of the air goes through the entire engine at supersonic speeds. This increases the stagnation pressure recovered from the freestream and improves net thrust. Thermal choking of the exhaust is avoided by having a relatively high supersonic air velocity at combustor entry. Fuel injection is often into a sheltered region below a step in the combustor wall. Although scramjet engines have been studied for many decades, only recently have small experimental units been flight tested and then only very briefly (e.g. the Boeing X-43). As of May 2010, this engine has been tested to attain Mach 5 (1,701.5 m/s; 6,125 km/h) for 200 seconds on the X-51A Waverider. A variant of the pure ramjet is the 'combined cycle' engine, intended to overcome the limitations of the pure ramjet. One example of this is the SABRE engine; this uses a precooler, behind which is the ramjet and turbine machinery. The ATREX engine developed in Japan is an experimental implementation of this concept. It uses liquid hydrogen fuel in a fairly exotic single-fan arrangement. The liquid hydrogen fuel is pumped through a heat exchanger in the air intake, simultaneously heating the liquid hydrogen and cooling the incoming air. This cooling of the incoming air is critical to achieving a reasonable efficiency. The hydrogen then continues through a second heat exchanger position after the combustion section, where the hot exhaust is used to further heat the hydrogen, turning it into a very high pressure gas. This gas is then passed through the tips of the fan to provide driving power to the fan at subsonic speeds. After mixing with the air, it is burned in the combustion chamber. The Reaction Engines Scimitar has been proposed for the LAPCAT hypersonic airliner, and the Reaction Engines SABRE for the Reaction Engines Skylon spaceplane. The upper atmosphere above about 100 kilometres (62 mi) contains monatomic oxygen produced by the sun through photochemistry. A concept was created by NASA for recombining this thin gas back to diatomic molecules at orbital speeds to power a ramjet. The Bussard ramjet is a spacecraft propulsion concept intended to fuse interstellar wind and exhaust it at high speed from the rear of the vehicle. ^ McNab, Chris; Keeter, Hunter (2008). "Death from a Distance Artillery". Tools of Violence: Guns, Tanks and Dirty Bombs. Oxford, United Kingdom: Osprey Publishing. p. 145. ISBN 978-1846032257. Retrieved February 12, 2016. ^ "Here Comes the Flying Stovepipe". TIME. Time Inc. November 26, 1965. Archived from the original on April 8, 2008. Retrieved April 8, 2008. ^ Liukkonen, Petri. "Savien Cyrano de Bergerac". Books and Writers (kirjasto.sci.fi). Finland: Kuusankoski Public Library. Archived from the original on February 14, 2015. ^ Zucker, Robert D.; Oscar Biblarz (2002). Fundamentals of gas dynamics. John Wiley and Sons. ISBN 0-471-05967-6. ^ Gyorgy, Nagy Istvan (1977). "Albert Fono: A Pioneer of Jet Propulsion" (PDF). International Astronautical Congress. IAF/IAA. ^ Dugger, Gordon L. (1969). Ramjets. American Institute of Aeronautics and Astronautics. p. 15. ^ Hirschel, Ernst-Heinrich; Horst Prem; Gero Madelung (2004). Aeronautical Research in Germany. Springer. pp. 242–243. ISBN 3-540-40645-X. ^ "Missed Swiss". Time Inc. July 11, 1955. Retrieved August 27, 2017. ^ "Underwater Jet". Time Inc. March 14, 1949. Retrieved August 27, 2017. ^ "A Century of Ramjet Propulsion Technology Evolution", AIAA Journal of Propulsion and Power, Vol. 20, No. 1, January – February 2004. ^ "Aérospatiale studies low-cost ramjet", Flight International, December 13–19, 1995. ^ "Hughes homes in on missile pact", Flight International, September 11–17, 1996. ^ Procinsky, I.M., McHale, C.A., "Nozzleless Boosters for Integral-Rocket-Ramjet Missile Systems, Paper 80-1277, AIAA/SAE/ASME 16th Joint Propulsion Conference, June 30 to July 2, 1980. ^ 11.6 Performance of Jet Engines. ^ "Boeing: History – Chronology 2002–2004" Archived November 14, 2011, at the Wayback Machine. ^ "USAF vehicle breaks record for hypersonic flight" Archived April 10, 2016, at the Wayback Machine. ^ PRELIMINARY SURVEY OF PROPULSION USING CHEMICAL ENERGY STORED IN THE UPPER ATMOSPHERE By Lionel V, Baldwin and Perry L. Blackshear. Wikimedia Commons has media related to Ramjets.